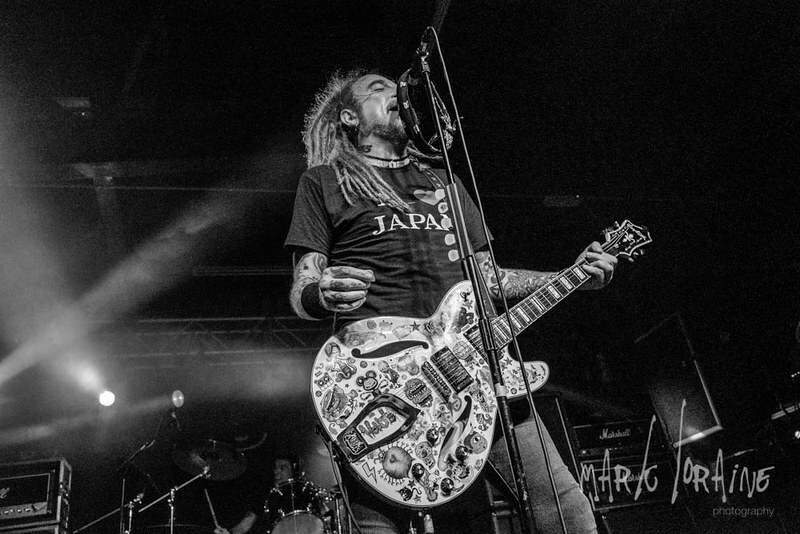 Apparently, tonight’s gig is billed as a warm up for The Wildhearts before they head off to Japan and Australia, let’s hope they enjoy similar size crowds out there as they are doing here in The Plug in Sheffield. Just as a side note, it has been rumoured that this pretty decent venue is soon to close and become a golf superstore – what a damn shame if it’s true, OK not a classic Sheffield venue along the lines of The Leadmill, but all the same a great live music outlet. Another One Bites The Dust (if you needed a musical reference). So, to tonight! Well, as I arrive a little late into the venue, the heavy, heart thumping, bowl crunching bass tones hit me and virtually knock me back out the door. Yes, Raging Speedhorn are tonight’s support and boy are they heavy. 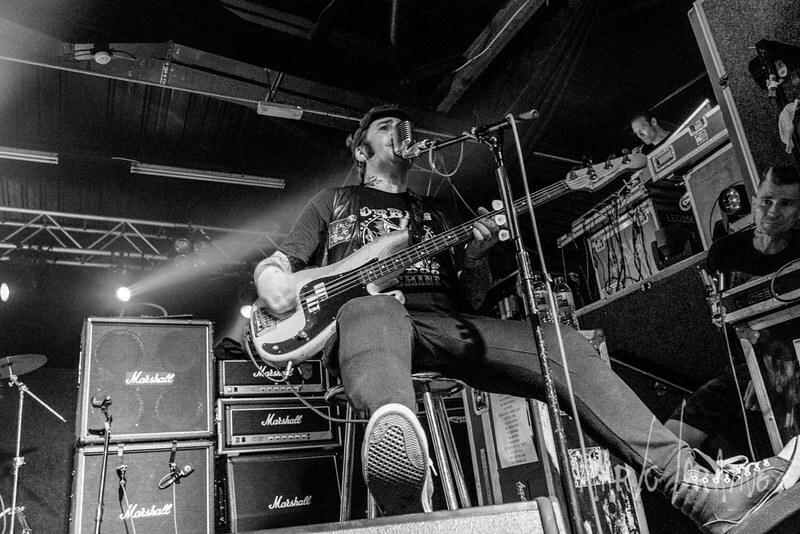 Dual vocals only just cutting through the belting bass and guitar which really does Hit You Like a Hammer (OK, another musical reference… probably). Now I must admit that this heavier end of the heavy metal spectrum has never been my thing. I once saw Napalm Death in their heyday for goodness sake and I hated them! Speedhorn to give them their due do sound like they are doing their genre proud (Wikipedia has the genre down as Sludge Metal!) but tonight just not for me. As I am also photographing this gig as a guest of the headliners, OK CJ Wildheart sorted me a pass after seeing some of my photos from their Britrock Must Die gig and he loved them (self-aggrandisement over, I promise), I head to the pit after Raging Speedhorn vacate and am ready for what is fast becoming my favourite band of the moment. I must admit at this point, that up until their co-headlining tour with Reef and Terrorvision I had not really paid them much attention, but since I have devoured all their output at least once. OK, I am not a long-term fan like the rest of the crowd and I certainly don’t know enough words to sing along, although I did try to TV Tan, I do count these guys as a band that I was really looking forward to seeing again. 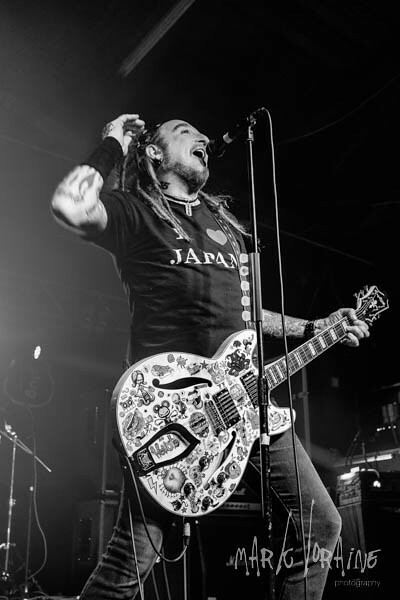 In my most humble opinion, The Wildhearts fall into that classic mould of a British Rock band that play Rock well and have done their very, very best to live a life that is not only a Rock n Roll lifestyle but is one that still bears musical fruit. I don’t want to put an age on the guys on stage in front of me, but I am glad that they appear somewhere near to my age and that I am certainly not the oldest in this crowd tonight – not by far. I like the idea that they still enjoy what they do – a situation which is obvious on stage tonight and that they are still out there entertaining. Entertaining – now there’s a concept! 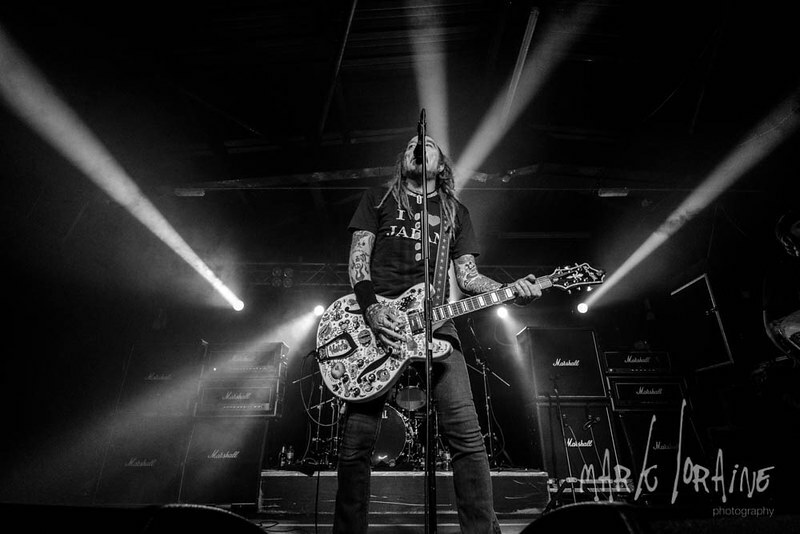 A lot of bands today are great at playing music, they offer up great riffs, fabulous melodies and some blistering guitar work, but most just do that, they tend to be silent in the gaps and that’s where The Wildhearts differ. From the off, frontman Ginger is telling stories, playfully (I hope) chastising photographers and generally drawing the audience in. To me this is part of the Rock show and is a part that is, I feel, slowly evaporating. OK, the music is still awesome, and I love new music with a passion, but as a person who saw Bruce Springsteen on the Born in the USA tour way back in 85 where every song was supported by a full-length monologue from the boss, I have to say I am a huge fan of audience information! 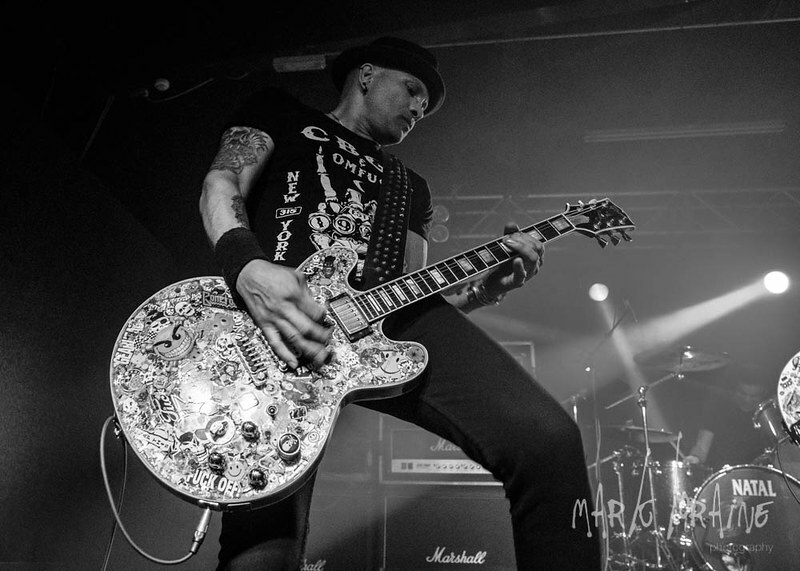 To support this however you need to have great songs too and The Wildhearts have a back catalogue that has some absolute gems. From the previously mentioned TV Tan, to Sucker Punch and Geordie in Wonderland (cue huge sing along) all come out of the bag tonight to the delight of the massed crowds. A new personal favourite of mine is Red Light Green Light from the album Fishing for Luckies, although 29 X the Pain is also immense! The band perform all their songs with a real energy, even when one member has to be seated! and they look fresh and new if that’s at all possible bearing in mind their history. 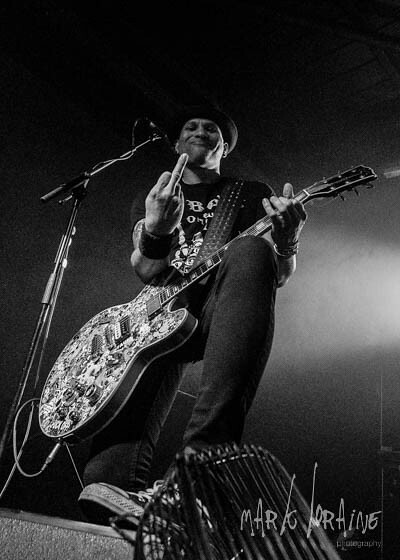 All in all I was ostensibly here to photograph tonight’s gig, but that said, The Wildhearts deserved a few words to go with the photos if I am honest and although this may appear to be a fan-boy review (I assure you it really isn’t) I would urge you to see this band at your earliest, but beware, I saw them once and was hooked.